After you add overrides to Endpoint Protection, you can view them in the Overrides tab. Select a policy from the left panel to narrow the results shown on the right. 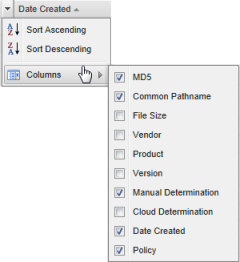 Your selected overrides appear under the Manual Determination column. If desired, you can show or hide additional data about the overrides. Click a column header to open the drop-down menu, then click in the checkboxes to select the columns to add or remove. Command Filename The name of the Windows file as it would display in a file folder. This column is static; you cannot hide it. Common Pathname The name of the Windows folder structure. File Size The file size in bytes. Manual Determination Your designation for the file, which is either Good or Bad. Cloud Determination Webroot's classification for the file, which is Good, Bad, or Undetermined. Data Created The date and time this override was defined. Policy The policy where this override is applied.